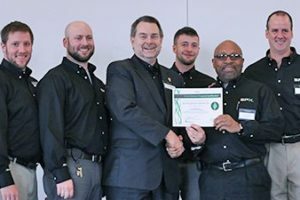 In December 2014, the Wisconsin Sustainable Business Council named SPX Transformer Solutions’ Waukesha location a 2014 Green Master facility, recognizing the company for its continued dedication to achieving sustainable business practices. The Wisconsin Sustainable Business Council Green Masters Program was developed to encourage, recognize and reward local businesses for their progress in achieving their sustainability goals. practices in each of the nine criteria to qualify for consideration. Points are awarded to participating businesses based on each company’s responses to a questionnaire, and those points are used to classify participants into three levels of recognition: Green Apprentice, Green Professional and Green Master. Just the top 20 percent of participants earn the distinction of being recognized as Green Master facilities. With an overall score of 509 points, the Waukesha facility was able to garner a Green Master designation, due in part to a recent soft water initiative. In order to minimize water usage and chemical costs for operation of the plant’s four cooling towers (used to cool our test transformers, motor generator sets, vacuum pumps, vapor phase and coil processing chambers), a soft water system for the make-up water was implemented. By utilizing this system, SPX anticipates a savings of approximately 1,040 gallons of chemicals and 4.45 million gallons of water each year. Since being implemented in September 2014, this project has helped the Waukesha plant reduce its overall water consumption by 23 percent. 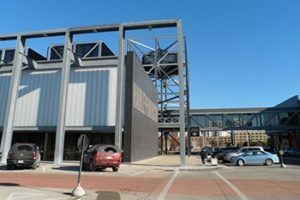 The SPX team accepted its award at the 7th Annual Wisconsin Sustainable Business Council Annual Conference on December 3, 2014 at the Harley-Davidson Museum in Milwaukee.